Hello Everybody! 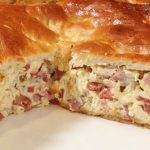 Today I am sharing with you my Pizza Rustica recipe! 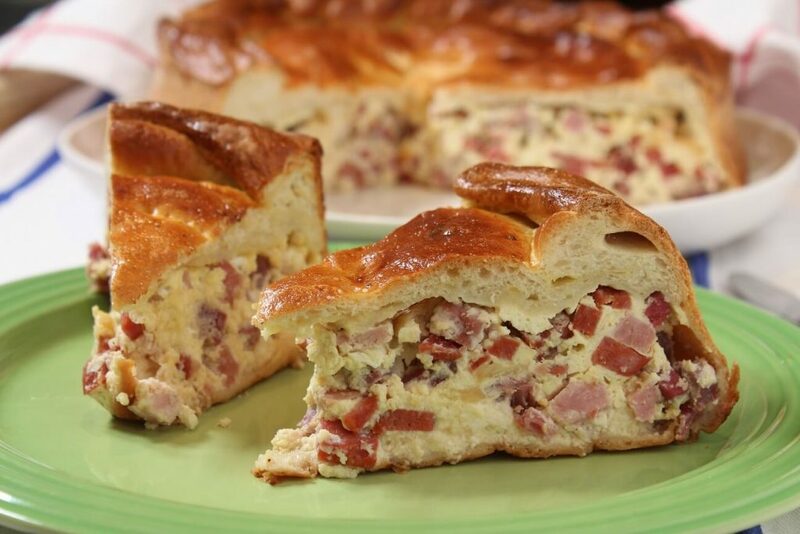 This delicious Pizza Rustica recipe is perfect to make for Easter. Add all of the meat ingredients I used below or add just a few or choose your own. So many options, yet so tasty whichever you choose! 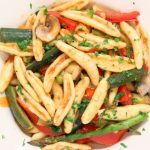 Watch the full video to follow along as I cook this recipe step by step or continue scrolling for the written recipe. 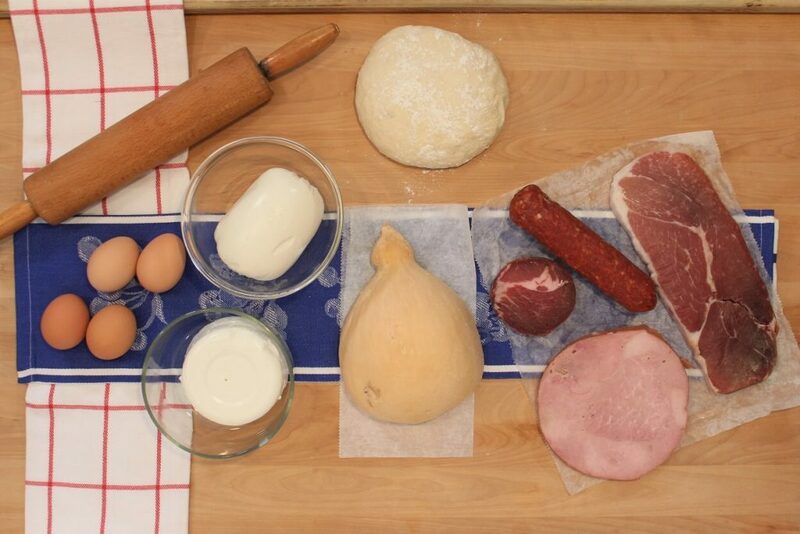 Let’s begin making the pizza dough. Add the yeast into the cup of warm water and mix. Let sit for about 10 minutes before adding to the flour. Meanwhile add the flour, salt, sugar, and olive oil into a large mixing bowl. Now it’s time to add the yeast mix into the bowl of flour. Start mixing the flour and yeast mix and if it is still too sticky, slowly add in the extra water you had set aside. Only add a little bit at a time. If the dough is too watery, you need to add more flour. Continue to knead until evenly mixed and the dough is not too hard or soft. Once the dough is done, form it into a ball and then twist it in half to make two pizza dough balls. Sprinkle some flour into two separate bowls and place each dough ball into each bowl. Sprinkle some flour on top of each pizza dough ball and cover with saran wrap. Let it sit in a warm area for at least an hour to allow the dough to rise. Now it is time to prepare the stuffing. 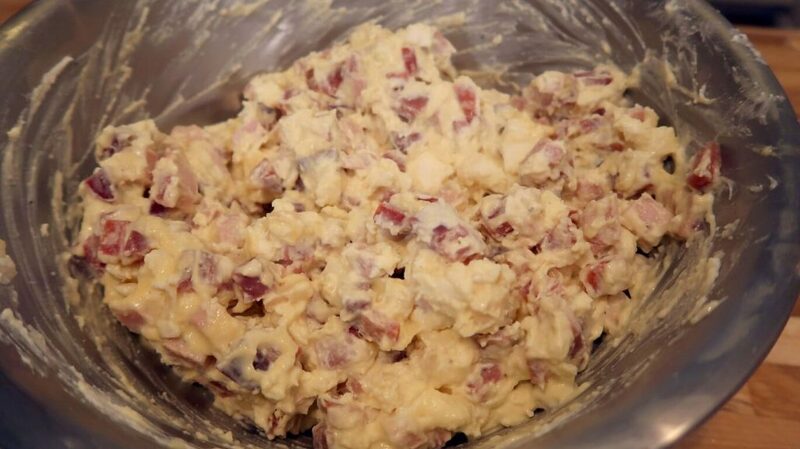 In a big mixing bowl, mix all of the stuffing ingredients together, making sure that the eggs are completely mixed in. 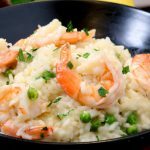 Keep about two tablespoons of the egg mixture to use for later. Drizzle a bit of olive oil into a springform pan and use a brush or a paper towel to evenly coat the oil on the bottom and sides of the pan. After uncovering the dough, it should look relaxed and ready to be flattened. Sprinkle a few tablespoons of flour onto your working area. 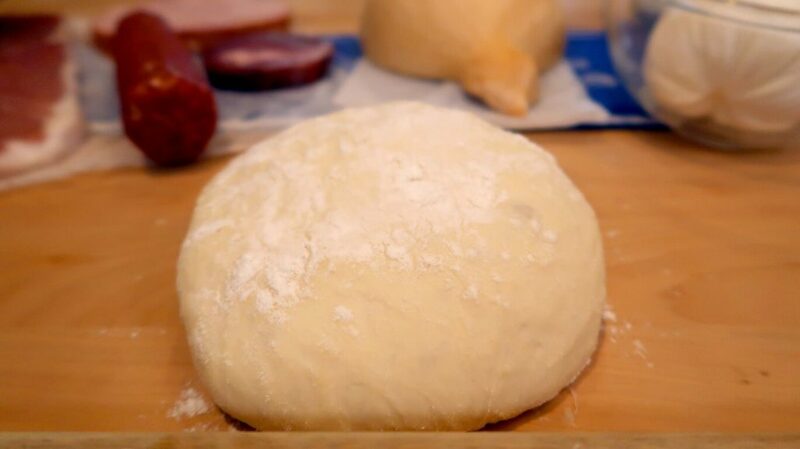 Begin flattening the dough into a pizza shape with your hands and then use a dough roller to flatten it out. It needs to be big enough to cover the pan. Place over the springform pan, letting it completely cover the bottom of the pan and the extra dough hang over the edge. Next, pour the stuffing ingredients into the pan and spread it out evenly over the pizza dough. Roll out your second pizza dough ball and drape it over the top of the pan, making sure to pack it in close to the top of the stuffing ingredients. Press the top dough into the bottom layer dough to seal the stuffing inside. Cut off any of the excess dough from the top dough layer and remove from the pan. Fold the bottom layer dough over the top layer to seal in the stuffing. Brush any leftover of the egg mixture on top of the pizza dough. This gives the dough a nice golden brown crust. Take a fork and punch holes into the top layer of the pizza dough to create vents. Bake in the oven at 400°F for 1 to 1.5 hours. 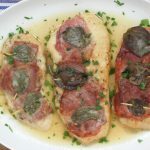 Remove from the oven and let sit at room temperature for a couple of hours before serving. 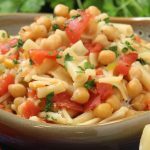 This allows for the filling to cool down and really stick together as one piece. 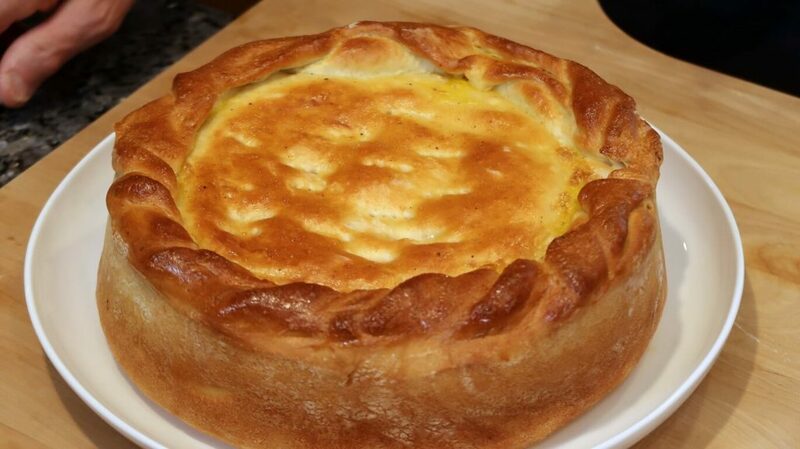 After the Pizza Rustica has fully cooled down to room temperature, slice a piece, serve, and enjoy! Salute and Cin cin! 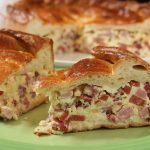 Today I am sharing with you my Pizza Rustica recipe! 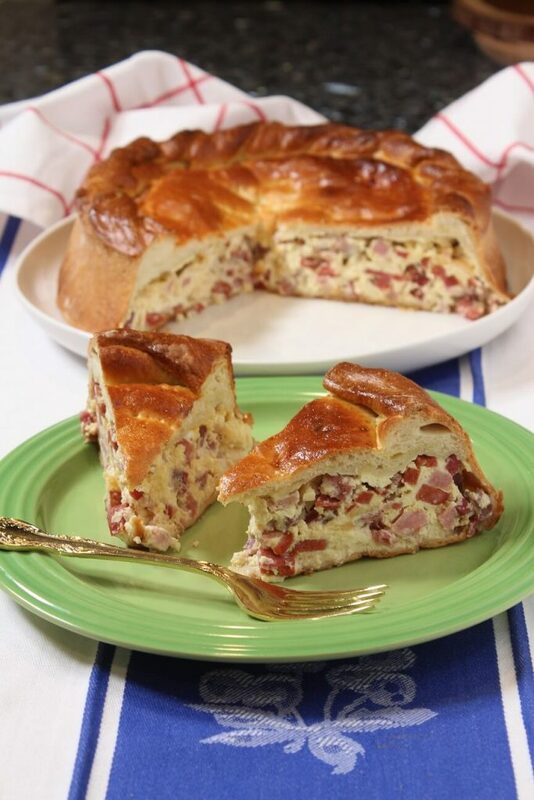 This delicious Pizza Rustica recipe is perfect to make for Easter. Add all of the meat ingredients I used below or add just a few or choose your own. So many options, yet so tasty whichever you choose!